Spicy Thai Butternut Squash Soup made with roasted butternut squash, onion, garlic, ginger, cayenne pepper, and red curry paste. Easy, healthy, vegan, gluten-free. Preheat the oven to 200 degrees C (400 degrees F) and line a baking sheet with parchment paper. Cut the butternut squash in half lengthwise, remove the seeds and place face down on the baking sheet. Bake for 30-35 minutes or until the squash is tender. Heat the oil in a large pan over medium heat. Add the onion and sauté for 3-4 minutes. Add the garlic, ginger, and sauté another 1-2 minutes. Scoop the flesh out of the squash. Add it to the pan, along with the red curry paste, cayenne pepper, and salt. Stir everything together then pour in the vegetable stock. Bring the mixture to a boil, reduce the heat to low, and let it simmer for 15 minutes. 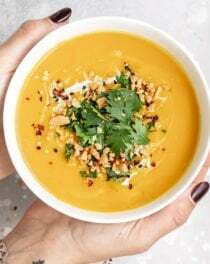 Use an immersion blender and blend the soup directly in the pan or ladle the soup carefully into a blender and blend until smooth and creamy. If the soup is too thick, add a bit of vegetable stock to thin it out and blend again. Taste and adjust seasonings. Ladle the soup into bowls and top with chopped cilantro, roasted peanuts, sesame seeds, and a squeeze of lime juice. The soup will keep in the fridge for up to a week and freezes well for up to 3 months.